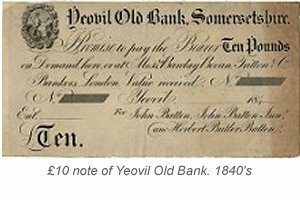 Yeovil Old Bank was a private bank established by 1774, by Samuel Daniell who was appointed to receive and exchange deficient gold coin. The firm was known as Samuel Daniell & Co by 1796. 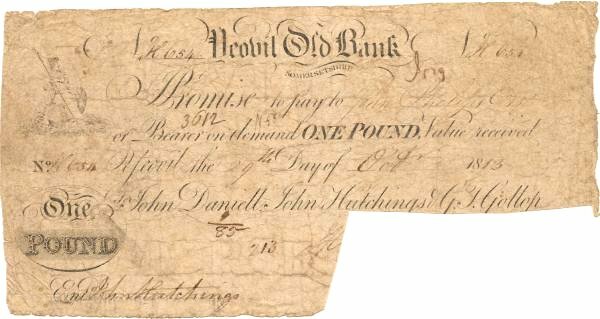 By 1812 it was known as Daniell & Hutchings and by 1817 was known as Yeovil Old Bank owned by Daniell & Co.
By 1819 it had been acquired by Edmund Batten and his partner Samuel Sparkes, a banker of Crewkerne and Chard, and was known as Batten, Sparkes & Co. By 1823 it was known as Batten, Sparkes & Baker's bank when Lazarus Baker joined the partnership. Lazarus Baker died in January 1829, the Sherborne Mercury reporting "Mr Lazarus Baker, Banker. 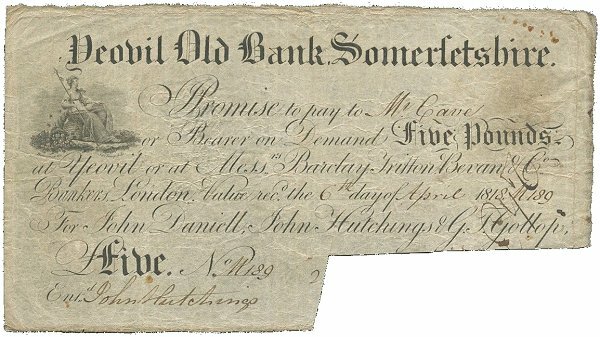 Mr Baker's friendly disposition and urbanity of manners, during his long connection with the Yeovil Old Bank, gained him universal esteem." Samuel Sparks, who also had his own bank of Sparks & Co at Crewkerne, decided to retire and the partnership between Sparkes and Batten was dissolved in May 1829. However it seems that retirement was perhaps somewhat forced as the Sherborne Mercury reported in its edition of 18 May 1829 "We are sorry to have to announce the stoppage of the Bank of Messrs. Sparkes & Co, at Crewkerne, and consequently of the Chard branch of the same establishment. Speculation in the of the lace and sailcloth manufactories, is stated as the cause of the embarrassments of the firm. Mr S Sparks was also a partner in the Yeovil Old Bank; but his name had been withdrawn prior to the suspension of payments at Crewkerne, and for this highly respectable establishment, under the firm of Messrs. E and J Batten, retains in the highest degree the confidence of the public." Following the death of Baker and the retirement of Sparkes, Edmund Batten's nephew, John Batten, joined the bank which by this time was known as Yeovil Old Bank. After Edmund Batten's death in 1836, partnership in the bank was John Batten Snr, John Batten Jnr and Henry Butler Batten. In 1844 it was reported, in accordance with new legislation, that the bank had 10,033 of its banknotes in circulation. By 1846, after the death of John Batten Snr, the partners were John Batten Jnr and Henry Butler Batten. In 1848, when it was known as J & H B Batten, the bank was acquired by Stuckey's Banking Co of Langport. The Sherborne Mercury reported, in its edition of 11 November 1848 "The eminent and long-established bank of the Messrs Batten or Yeovil Old Bank (one of the oldest in fact in the West of England) was associated on Friday last with the great banking-establishment of Messrs Stuckey & Co."
In 1852, following an Act of Parliament, the Yeovil Old Bank ceased to issue its own banknotes. 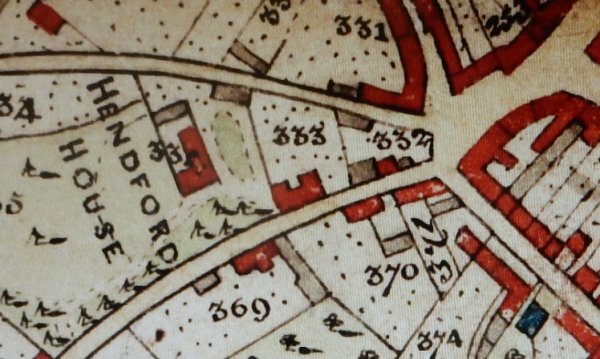 This is a portion of the 1842 Tithe Map showing West Hendford running across the map from top left to join Hendford which runs up from bottom left. Hendford House is today's Manor Hotel and the Yeovil Old Bank, here marked as Parcel 333, is at centre. Parcel 369 at bottom centre was the Yeovil Old Brewery. 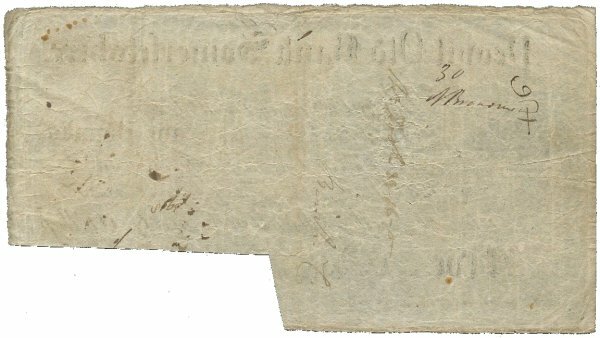 A £1 banknote (signed by John Hutchings) of the Yeovil Old Bank, dated 29 October 1813. 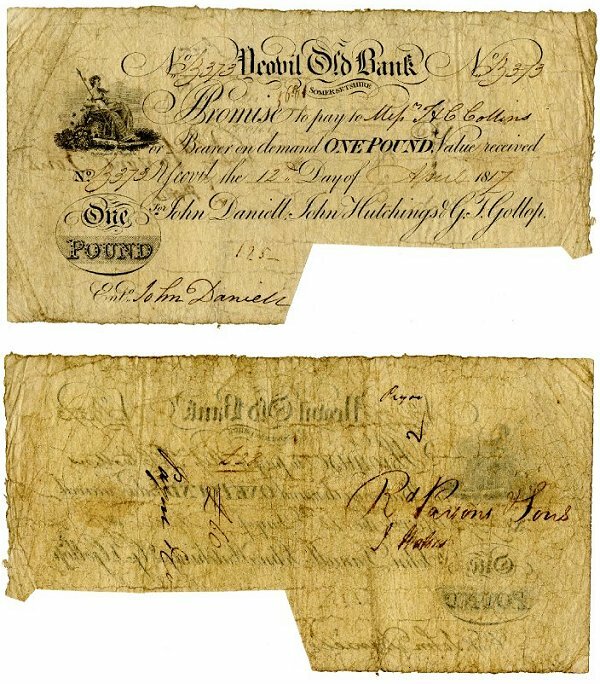 The obverse (signed by John Daniell) and reverse of a Yeovil Old Bank £1 note of 1817 (about £60 at today's value). 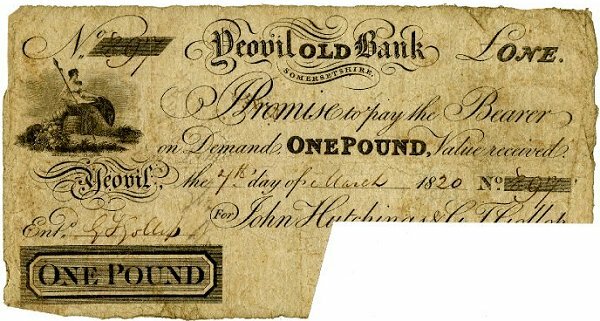 The obverse of a Yeovil Old Bank £1 note, with a slightly different design, of 1820. The obverse and reverse of a Yeovil Old Bank £5 note of 1814 (about £290 at today's value). 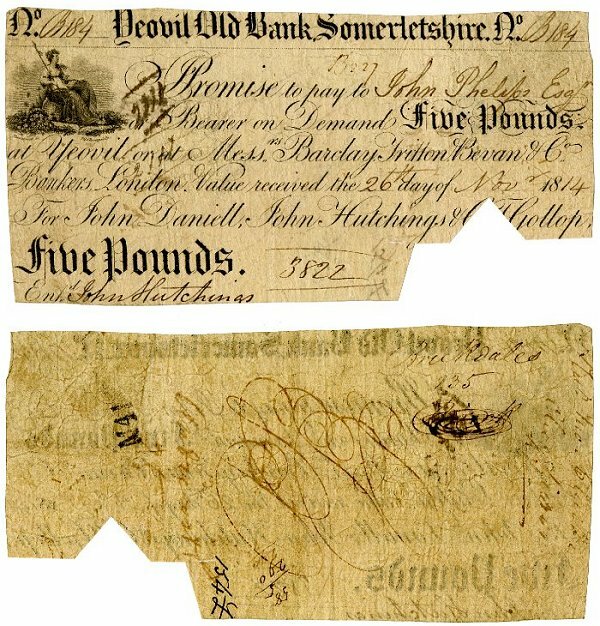 The obverse and reverse of a Yeovil Old Bank £5 note, printed on one side, of 1818. Signed by John Hutchings, it was payable to brewer Thomas Cave. 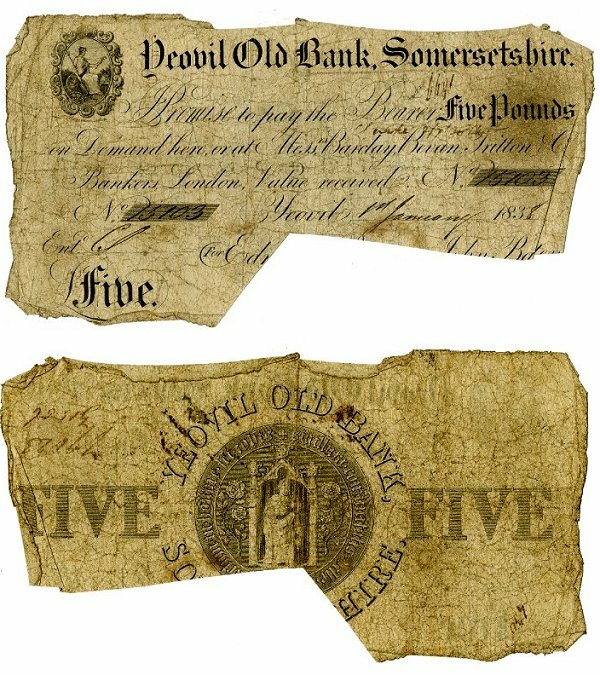 The obverse and reverse of a Yeovil Old Bank £5 note, printed both sides, of 1838 (about £380 at today's value). The image at the centre is of St John the Baptist and based on the seal of the Borough of Yeovil. Actual size = 195mm x 104mm. 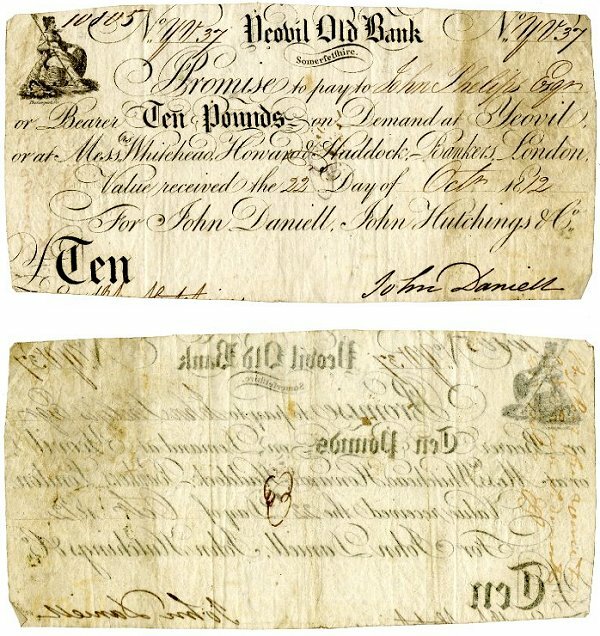 The obverse and reverse of a Yeovil Old Bank £10 note of 1812 (about £560 at today's value). 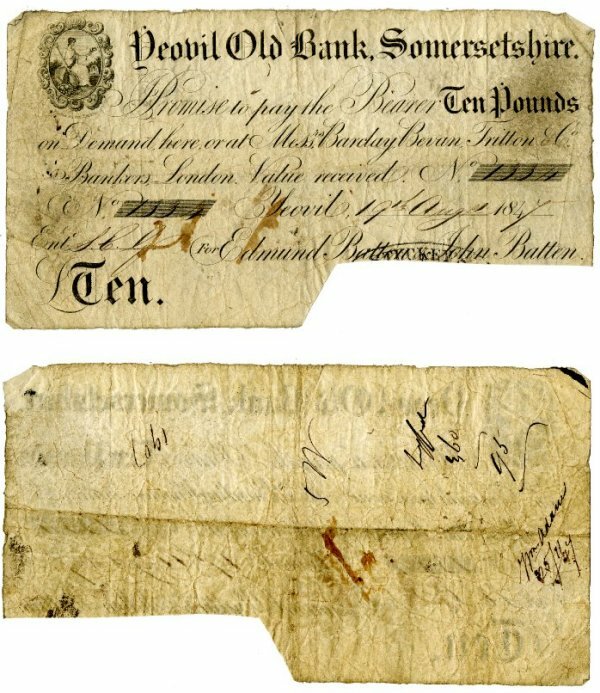 The obverse and reverse of a Yeovil Old Bank £10 note of 1847 (about £775 at today's value). Actual size = 192mm x 104mm. The notice dissolving the partnership of Edmund Batten and Samuel Sparks, published in the Dorset County Chronicle's edition of 14 May 1829. A notice placed in the Western Flying Post's edition of 18 November 1833 to warn against accepting a certain note of the bank that, with others, had 'miscarried'.